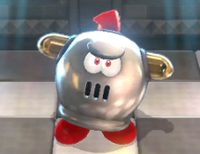 Prince Bully is a boss that first appears in Super Mario 3D World as the enemy of multiple Enemy Battles. He is a large Bully with red feet, made out of silver metal with large, gold horns. The fact that he has a crest of red feathers like those of Corinthian or Gaelic helmets and that he also spews fire from his boiler-like mouth makes him resemble a half centurion helmet and half furnace. Prince Bully about to be pushed into the Clear Pipe. 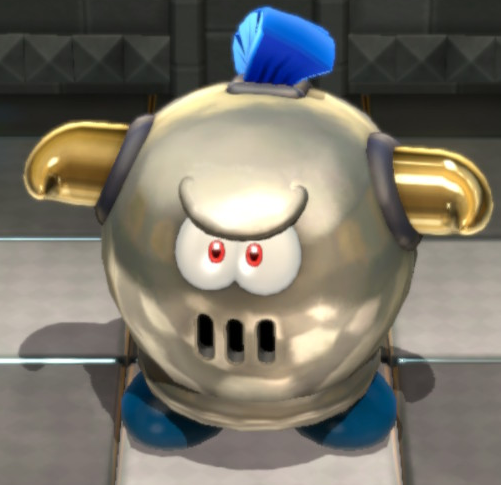 Prince Bully appears in World 6 in the level Prince Bully Blockade. Like other Bullies, he will attempt to ram into the player. This will not damage the player, though, as the player will be violently bumped away. After the player rams him, he will spew a red fireball at the player, glaring at and watching the player's every move. In the second encounter in World Castle in the level Prince Bully Blockade Is Back, Prince Bully has blue crest feathers and blue shoes instead of red ones. Rather than just spitting one red fireball that will fly straight, he will spit out three blue fireballs that sort of home in, curving toward the player, the amount of which will increase by one each time he is damaged, but his general attack pattern is similar to the first encounter. In both encounters, the player should force him into a nearby Clear Pipe, where he gets sucked in and spat out through another, rolled into a cylinder, at which point he must be pounced on, throwing him across the room. After three hits, Prince Bully, like world bosses, will explode into a circle of coins along with the Green Star he was guarding. This page was last edited on March 10, 2019, at 00:43.